Sun Ce cannot use or play any diamonds. During his turn, if he has any diamonds, he puts them face up and they are Energy. Once per turn, Sun Ce can discard X Energy. He can then draw one card from X players. 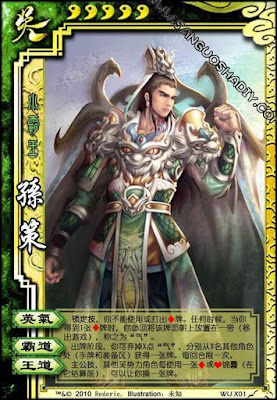 King Ability: Whenever a member of Wu uses a red tool card, before it works, they can allow Sun Ce to draw one. If Sun Ce has a hand full of diamonds, he has to wait until his turn to put them all down as energy. Sun Ce's Energy cannot be targeted by Steal or Break. During any turn, Sun Ce cannot discard more Energy there are other living players. Sun Ce can only take one card from each player maximum.